As Mac OS X was starting out in 2001, Jonathan Ploudre looked back at BeOS, which Apple had considered as a potential replacement for the Classic Mac OS when it gave up on its Copland project. BeOS had much to commend itself, including a whole different kind of system architecture that made even older Macs snappy. BeOS or NeXT: Did Apple Make the Wrong Choice? BeOS was very responsive, even on older Macs, and its journaling file system was way ahead of what Apple and NeXT had. BeOS and BFS, the BeOS Filing System explains the advantages of a journaled file system. 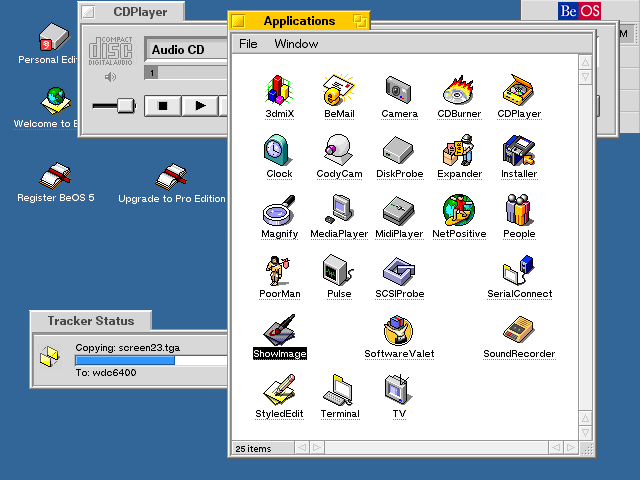 User Interface: Mac vs. BeOS looks at some of the UI choices made by Be’s developers. Using BeOS on a Power Mac looks at how well BeOS worked on PowerPC Macs while pointing out how disappointing it was that it would never run on G3 and G4 Macs. NeXT: Apple’s Right Choice concludes the series, examining why NeXTstep was a good choice for basis of Apple’s next generation operating system. There is an Open Source project called Haiku that is working to try to clone the BeOs. It has come a long way over the past 10 years or so and is worth a look.